We have started selling our new puzzle "Mirii 6x4." 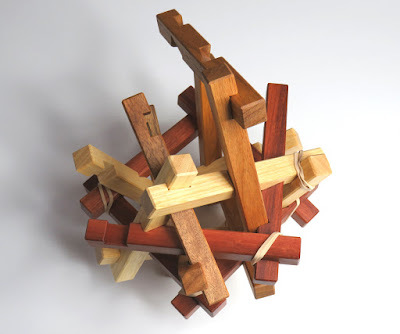 This is our third version of the Mirii series polyhedral shape puzzle. This time, Juno has chosen six intersecting squares for the theme and has chosen all 15 possible shape pieces to be used for the 24 pieces burr puzzle. 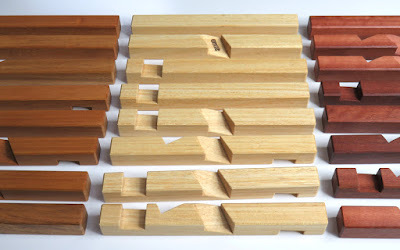 The timbers which were used for Mirii 6x4 were PNG Rosewood, Koto and Jarrah from the left to the right on the image below. The edges of the pieces are all arrised. Even the insides of the checkouts are lightly sanded after the first coat. The puzzle is very difficult but please be assured, we will provide you a very detailed step by step solution upon request. The solution will also tell you where to find good places to put rubber bands for temporary support to hold puzzle pieces. 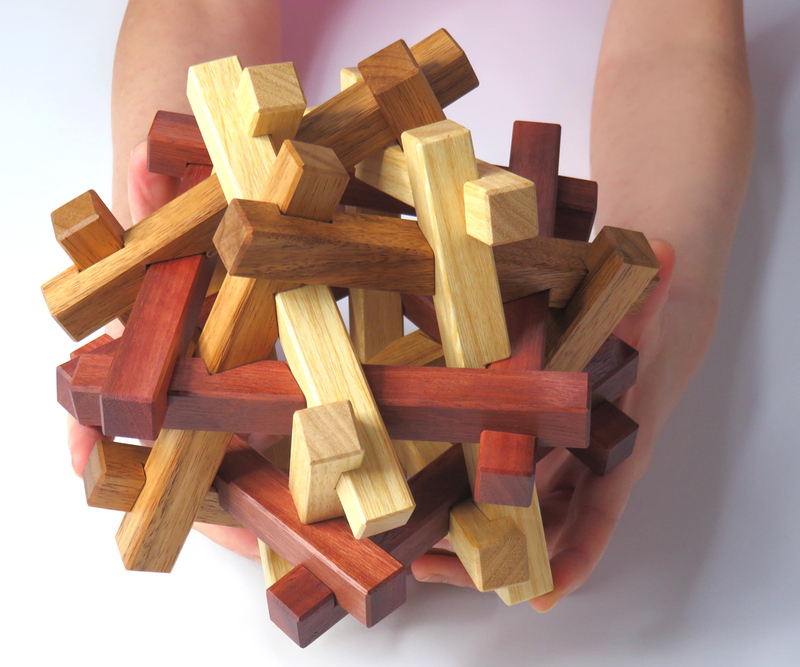 During the production of the puzzle, Juno made a simple mistake for the quantity of the material and the number of the finished product doubled. He complained how many checkouts he had to make, how much sanding and arrising he had to be done. Yep, he is responsible to his mistake. 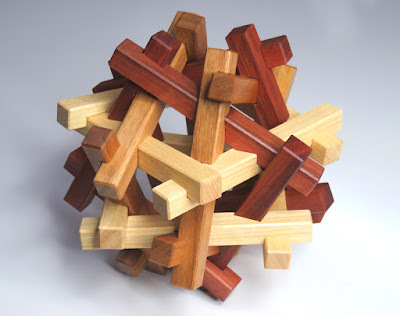 We have more puzzles to sell than we planned but it is not yet a large quantity. 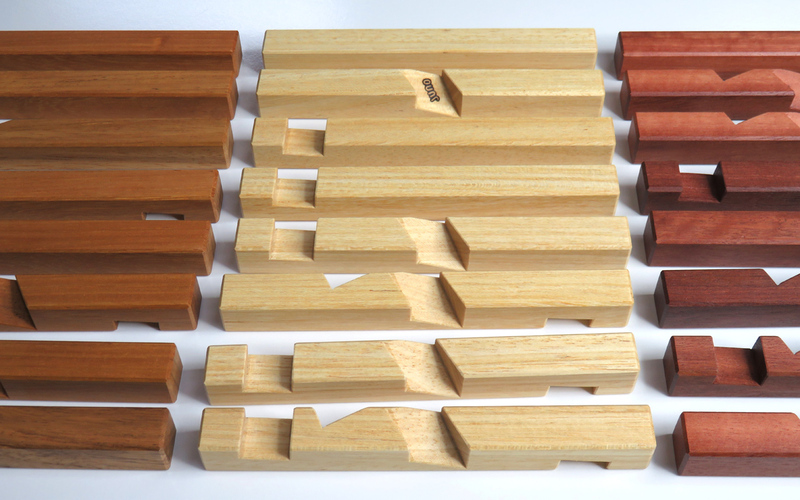 The puzzles on our online shop are all one-time productions and we won't make the same puzzles again. They are all limited products. So, I believe that he won't make this puzzle in the future as well.